Sanjeev Khanna stepped out of his usual sort of absent-minded personality to actively 'log into' the hearing, following the testimony alertly, at times standing up in the accused box to catch all of what was being said. His co-accused Peter Mukerjea and Indrani Mukerjea were less attentive, but were not switched off either. Niranjan Mundargi fancied himself to be Arthur Hailey. That day was October 31, Wednesday. 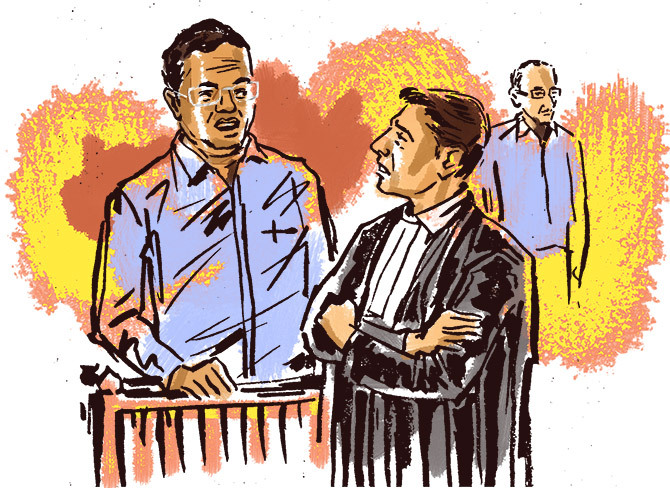 As the energetic lawyer, who always has a new legal strategy up his sleeve, started up his cross-examination of Prosecution Witness 22 Minguel D'Souza, Mundargi seemed to be recreating certain chapters of novelist Hailey's runaway bestseller Hotel for CBI Special Courtroom 51 at the Mumbai city civil and sessions court in the Sheena Bora murder trial. D'Souza, 42, who works at the front office of Hotel Hiltop, Worli, south central Mumbai, was the receptionist who checked Sanjeev Khanna, Accused No 2 and Indrani Mukerjea's former husband, out of the hotel early morning on April 25, 2012, the day after Sheena's murder. The hotel staffer who checked Khanna in the day before, on April 24, on his arrival in Mumbai after he got off from a flight from Kolkata -- Prakash Madan -- died later that year (2012) and there is today no one to testify when Khanna checked in, hence the increased significance of D'Souza's testimony. Khanna's lawyers Shreyansh Mithare and Mundargi have endeavoured tirelessly, since early last year, to prove before the judge that Khanna could not have ever been at the Bandra crime scene (8.9 km away and much further during weekday rush hour) at 7 pm on Tuesday April 24, 2012 or, later, part of the party that disposed of Sheena's corpse at Gagode Khurd, Raigad district, outside Mumbai, on the wee hours of April 25, 2012, given that he was 1. Still checking into Room 216 at Hiltop at 6.05 pm on April 24 and 2. He did not leave the hotel at 4.31 am the day after as per the police and the CBI's construction of the crime story. Mundargi's imaginative and elaborate dissection of the way hotels work, particularly Hiltop, through his train of narrative-building questions to D'Souza, was yet another effort towards cementing that 'truth' in place. To establish Khanna's innocence, the advocate took apart, bit by bit, the systems of Hotel Hiltop, like a mechanic opening the bowels of a car or, better, a scientist slicing a longitudinal cross section of the hotel, so all of us present in the courtroom could curiously peer in and view its operation, just like Hailey, who through his series of bestsellers showcased the workings of various businesses/institutions, including a hotel. Mundargi's sequence of questions, that took about 50 minutes to traverse, scrutinised the little processes that were in place at the Worli three star, making it the hotel it was/is. Further, he, with great thoroughness, actively aided by Indrani's lawyer Sudeep Ratnamberdutt Pasbola, who seemed to be nursing a cold, examined the practices according to which Hiltop functioned. Mundargi took the court through exactly what a guest faced the moment he stepped into the hotel (that has an impressive view of the Arabian Sea, the graceful Worli-Bandra Sea Link and where tariffs were quoting October 2018 at Rs 6,500 per night for a single room plus 18 per cent tax) and what followed thereafter. He firstly inspected Hiltop's check-in method. Mundargi made tiny-tiny queries of D'Souza on the procedure, to verify its length. What was the first step for a guest arriving at the hotel? How was the guest identified? Was he asked to show proof of his identity once his booking was retrieved from the hotel's computer system? Did he pay up front for his entire boarding before his stay began? How? Was the guest's ID immediately photocopied on the spot and returned to him or was it sent to his room? Did the guest have to wait for the receptionist to xerox his proof of identity? When did he sign the hotel register? Was he issued an electronic key card or was he presented a metal key? How was the key issued? Mundargi kept at it: Was the guest then told about the hotel services available, like the free breakfast, its hours and "Where the guest can come for breakfast?" CBI Special Judge Jayendra Chandrasen Jagdale corrected with a smile: "Venue of the breakfast." The lawyer continued: Were guests given a spiel by the receptionist, upon checking in, about the other facilities too like WiFi? Did a member of staff accompany a guest to his room with his luggage and to show him the facilities of the room he had just checked into? How many people manned the reception desk? Mundargi: "Is it correct that in the hotel register there is a column in which you narrate the time of arrival? Do you have a watch fixed at the reception (to verify that)?" Mundargi: "Do you look in at that watch every time a guest physically arrives at your hotel?" Most important: The lawyer wanted to know how long, in all, did an average check-in take at Hiltop reception desk? The advocate, always sunny-mannered and courteous, addressing D'Souza as Sir throughout, proceeded to check Hiltop's dining facilities and how its room service system worked right from the ordering of food to the billing procedure. And the times taken for preparing orders and their delivery. Was breakfast complimentary? Could an outside person dine at a Hiltop restaurant if s/he was not staying at the hotel? Was food ordered through room service prepared fresh? Could meals be kept ready in advance? Who tracked the tab and how were the meals paid? Did it not say on the room service menu that all meals were prepared from scratch and an order would take time to come? Did the waiter serve the food to the guest or at least place it before the guest? Suddenly Mundargi popped in a random, out-of-the-blue question -- Did D'Souza know who Hardiyal Mehra was? Knowing that D'Souza's interaction with Khanna had been limited to briefly checking him out in the wee hours of the morning he left Hiltop, issuing bill number No 624 of Rs 5,456.67, one wondered why Mundargi, even wearing his spiffy new Arthur Hailey hat, had this ongoing 20-minute obsession with the hotel's room service. A little research later unearthed that earlier statements, by various witnesses in this case, say that Khanna, a vegetarian, had ordered a vegetable au gratin soon after arrival on April 24, which given the hotel's cook-from-scratch policy would have taken quite some time to come. Everyone knew that, including a guest, if s/he had bothered to read the fine print on the hotel's room service menu which announced that food would take time to be prepared and delivered, as it was being done so freshly. Mundargi obviously lastly, and most meticulously assessed, via his onslaught of obsessive questions to D'Souza, how the checkout process happened at Hiltop and how the checkout time on Sanjeev Khanna's bill was actually generated. So what were D'Souza's answers like? How did he fare in the face of Mundargi's ambush? Was he a reliable prosecution witness? Was he able to identify the accused? D'Souza, dressed in formals -- light blue, long-sleeved shirt, black pants, extra-buffed black Hush Puppies, gold ring on his left hand, silver wire-frame glasses perched on his nose and a blue plastic pen in his left shirt pocket -- came across as neither nervous nor particularly uncomfortable. He did not prevaricate while answering a question and there were very times when he answered that he did not know or did not remember something. It was hard to believe he was anything but honest. He considered each query carefully, replying steadily -- proceedings were in English on Wednesday and his was competent -- and provided an often insightful answer that could have aided either the prosecution or the defence. The most stand-out moment of uncertainty was when CBI Special Public Prosecutor Bharat B Badami, who conducted the short testimony on Wednesday (Where is Badami's colleague Kavita Patil these days? ), asked D'Souza: "Can you identify if (Accused No 2 Khanna) is present in court today?" D'Souza said he could, but never pointed Khanna out or actually scanned his eyes towards him. The testimony concluded without the Mumbaikar front office manager exchanging a glance with Accused 2 Sanjeev Khanna or looking into his face. This brought on a disagreement a little later when Mundargi asked the hotel employee if he had identified Khanna in court and if the police ever put him through a procedure -- identification parade -- to point out Khanna after he was arrested. D'Souza said he had not been asked to identify Khanna by the police. Badami did not seem to want to allow Mundargi a chance to verify if D'Souza could point out Khanna in court, cutting him off with "He said he is present in court. Where were you!?" The judge vouched for that. The 42-year-old, SSC-pass hotel employee, 's/o of Dominic D'Souza' and 'r/o' of nearby Valmiki Chowk, Worli Koliwada, as per police/CBI records, had been working at Hiltop for over seven years. His daily routine saw him arrive at the hotel at 9 pm and work through the night to 7 am. Because of his long stint at Hiltop, the Worli resident knew the workings of the hotel pretty much inside out and was a valuable source of information. D'Souza's answers to Mundargi's rat-tat questions added a new take on Khanna's involvement, or perhaps lack of it, in this heinous crime that took away the life of a 24-year-old girl several decades too soon. Khanna, wearing a blue, checked shirt and black jeans, stepped out of his usual sort of sleepy-headed, absent-minded personality on Wednesday to actively 'log into' the hearing, following the testimony and previous statements alertly, and at times standing up in the accused box to catch all of what was being said. Indrani, in white and pale green, green bindi and pearl earrings, who looks her most beguiling when she offers her mysterious Mona Lisa smiles to the room or her ex-husbands (that make you wonder who exactly she is -- murderess, charmer, Lorelei-like siren bringing misfortune to the men she knows, unfortunate woman, hustler, victim, which!?? -- on Wednesday traded knowing grins or rounds of laughter with Khanna. Khanna's cousin was in court actively and diligently liaising between him and the lawyers. Guests checking in at Hiltop, D'Souza confirmed spent 10 to 15 minutes having their ID verified and photocopied and left the desk with their ID with them. A bell boy accompanied a guest to the room with the luggage and to show the room and would have done so for Khanna. D'Souza could not -- strangely -- remember (the hotel's policy in 2012) -- if the key issued to Khanna was electronic or an old-style, clunky metal one. He half smiled and then grimaced: "I don't remember about that point of time." He did know the waiter. Mundargi: "Are you aware who Hardiyal Mehra was?" Badami cut in impatiently and perhaps strategically: "Waiter, waiter!" Mehra was the waiter who brought Khanna his order of food on April 24 for which there is a receipt on file and is likely to be produced to the court at a later date. The exercise by Mundargi of ascertaining and subsequenty reinforcing that it was possible that D'Souza could have prepared the final hotel bill somewhat before Khanna actually checked out, since it was known Khanna was checking out, did not occur smoothly. Towards the end of the cross-examination Mundargi bravely attempted to conclude that D'Souza didn't really know when Khanna left the hotel even if the checkout time was stamped as 4.31 am April 25, 2012. Badami violently disagreed with Mundargi's conclusion, saying that D'Souza had not really said any such thing. Voices got raised. Indrani's lawyer Gunjan Mangla inserted her view. Badami turned to her and said angrily: "Madam don't disturb us. He is not your client", which made Mangla bristle back. Mudargi: "So whatever facilities used by the guest are looked into and the final bill is prepared while the guest is checking out?" Mundargi: "With regard to the present case... On April 25... Had the guest made a request to you that he was checking out?" Mundargi: "Did it happen that the guest informed you (in advance) that he wants to check out and prepare a bill?" Mundargi: "(Is it a practice) to generally try and keep the final bill ready so he (a guest) does not have to wait?" Mundargi: "Is the final bill kept ready before the guest arrives at the counter?" Mundargi enquired if those on the night shift at the reception at Hiltop used the "little leisure time" they got during the night hours, since there were not too many check-ins and check-outs, to do other work like keeping final bills ready. The 'cross' went off track there as D'Souza wandered away on some tangent about audit work. Mundargi confirmed again: "The final bill was prepared by you?" D'Souza: "Yes, prepared by me." D'Souza: "Sanjeev Khanna (Room 216)." Mundargi: "In the present case the checkout was at 4.31 am?" Mundargi: "Did you send the final copy of the bill to his room?" D'Souza: "(Gave it to him) at the reception." Mundargi: "In the computer at 4.31 the bill was ready. How long after that -- 10 minutes, half an hour... -- at what time did he leave?" Mundargi: "You don't remember at what point of time he (Khanna) physically left the hotel?" The Hiltop employee shook his head and said that he just took Khanna's signature on the bill: "I must have seen him for a few seconds." D'Souza remained calm throughout his stint in the witness box and not too many emotions chased across his impassive face. He spoke in a low voice during the 90 minute cross examination, which commenced with a few questions from Pasbola on the hotel register and some additional stamp and signature by D'Souza's colleague named just Kavita. He looked directly into the faces of lawyers' faces offering a polite "Yes Sir" or "No Sir" or longer explanations. Badami from time to time would interject firmly "Answer to the court!" which meant D'Souza should address his questions to Judge Jagdale instead of Messrs Pasbola and Mundargi. The only sign of perhaps nervousness or fidgeting was when from time to time D'Souza would splay his palms out on the papers in front of him in the witness stand and tap/rattle his fingers. Or look slightly beyond the judge's face to some nowhere point as the 'cross' proceeded on a hot, muggy, pre-Diwali afternoon of October, a month known in Mumbai for heat worse than summer. Mundargi wound up his cross examination of D'Souza on Wednesday with the routine/procedural defence lawyer declaration that the Hiltop hotel employee was falsely testifying at the behest of the police and the CBI. D'Souza did not react. After confirming that he was done, he slipped out of the witness box to sit in the corridor outside as he waited for a drop by the CBI vehicle. Inside the court Peter sat down to his several-course meal that had been brought to him by two of his long-standing friends. Before that his lawyers approached the judge about Peter's request for a bed in his cell and his wish to renew his British passport that had already expired (or was expiring). His bed application needed medical approval before it could be taken forward. Badami promised to check up on how Peter could renew his passport. Peter, taking the witness stand, wearing as always white and khaki, emphasised: "Someone has to do it on my behalf." The Sheena Bora murder trial will take a Diwali break and the next hearing, that will bring PW 23 to the witness box, was scheduled for November 14. Incidentally, the relatively insignificant and uneventful cross-examination of PW 21, a panch or one of the witnesses used in a panchnama, Vishwanath Parshuram Sharma, who gave his address as 5th Road, Khar West, north west Mumbai, occurred last week. His 'cross' was briefly conducted by Mithare after Pasbola declined. According to tattle in the corridors outside Courtroom 51, Sharma -- who said he was in the catering and wooden decorations business -- is a regular at court, and has testified as a panch in many trials. In the Sheena Bora case he was one of the two panchs who went with the police to Hotel Hiltop to collect the hotel guest register for April 2012. Sharma identified that register in court, in which there were entries of other guests who had checked in and out during that period. Interestingly, Khanna's entry, on page number 4,583, was the only one in block letters and the only one written in black ink. As the Wednesday hearing wound up Indrani cheerfully bid everyone "Happy Diwali!" -- greeting the lady clerks, journalists and Badami -- before daintily traipsing out of the court. Peter followed some ten minutes later or more, herded along by a long-suffering cop, his face expressing the frustration he felt at the delays involved in escorting the Sheena Bora murder case accused back to jail. The clock had already struck five and Courtroom 51 was closing down for the day. Infectiously cheerful peon Waghmare carried Judge Jagdale's black bag and thermos downstairs, indicating that Judge Jagdale would be exiting any time soon. The little television screen, that posts information on hearings, which hangs high above the entryway of Courtroom 51 that was still decorated with a Dusshera mala (garland), had already winked shut. The brightly-lit up screen is the latest addition to this court environment. And though it has limited functionality, because of its height and therefore lack of readability, when you look up at it you get a warm feeling. Maybe because it seems to herald the change that could eventually come to these corridors of justice.